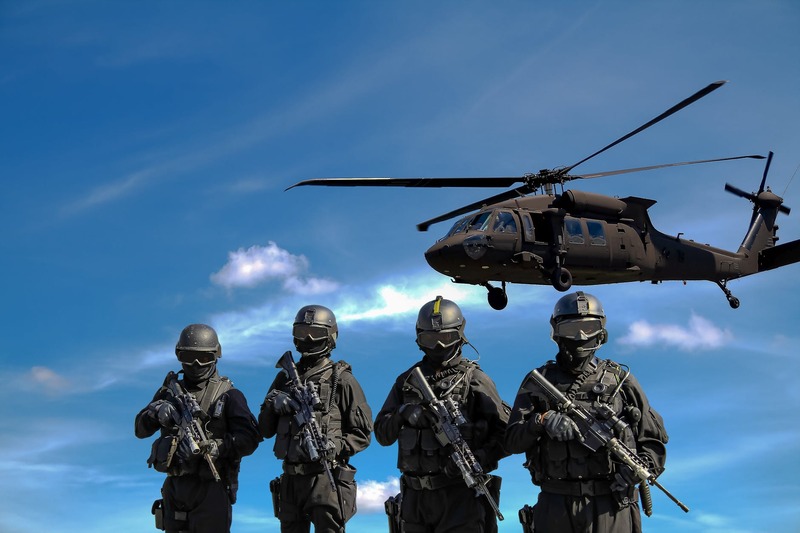 “The threat or use of coercive action for the purpose of protecting or assisting people at risk.” This is how Daniela Abratt defined humanitarian intervention in the Denver Law Review. After bombing Syria on April 6 in response to an alleged chemical weapons attack, Trump’s tweets declared that it was a “Mission Accomplished.” According to the New York Times, There was a total of 105 US missiles launched toward Bashar al-Assad’s Al-Shayrat airbase, along with French and British coordinated attacks. This airbase was the key element of a chemical weapons attack that killed more than 80 civilians. The Barzeh research and development center near Damascus and Homs was also targeted, but may have been emptied prior to the attack. Syria has a long history that has been disrupted by war and unrest, now the government and other forces are fighting viciously to hold what is left. A well thought out humanitarian intervention can mean the difference between a brutal dictatorship and peace. Syria is bordered by Turkey, Iraq, Jordan, Israel, Lebanon, and the Mediterranean Sea. As written in Our World, Syria is the birthplace of civilization and home to a little over 17 million people. It gained its independence from France in 1946. 74 percent of the population is Sunni Muslim and the largest religious minority are the ruling elite, Alawites. The Arab Spring in 2011 resulted in an eruption of anti-government protests in many Middle Eastern countries. When Syria followed suit, scholars from Khan University in Pakistan, Hafeez Ullah Khan, and Waseem Khan write that the Assad regime responded aggressively, often breaking up rallies with live fire. Since then, the war has brought devastation to Syria. The Syrian government, opposition rebels, and Islamic militants have proven that the lust for power and the struggle for ideals can result in the most horrible acts of violence. Foreign powers have turned the Middle East into their personal sandbox, sculpting the region to whatever shape is to their liking. 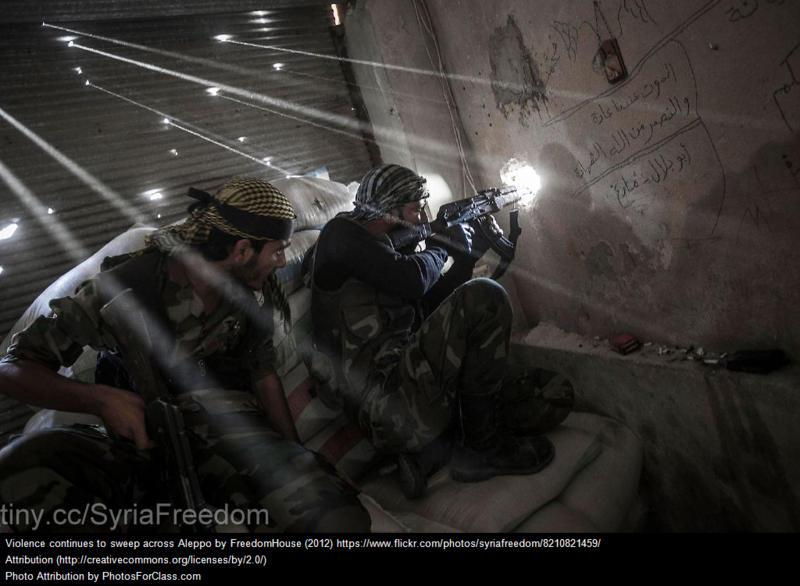 The Syrian civil war exemplifies that dictators cannot rule easily. Dictators will face opposition until the essence of freedom in the human spirit is satisfied. But, while the regional forces rain down their fire (conventional and chemical), ancient towns and modern cities have been reduced to rubble and hundreds of thousands have been massacred and even more displaced. According to the Center for Strategic and International Studies, since 2011, more than 400,000 people have died, including tens of thousands of children, since the beginning of the fighting. More than 13.1 million Syrians inside the country are in critical need of assistance and those who were lucky enough to leave, 5.6 million refugees, are now without a home. Health facilities have been specifically targeted, schools are now used as military base camps, and fuel shortages have made life even harder on the Syrian people. More needed infrastructure is destroyed every year the war continues. Syria’s chemical weapons program was first discovered in August 2013 when Assad’s regime fired around 15 rockets filled with deadly chemical agent onto its streets, killing hundreds and wounding thousands. A second time, April 4, 2017, despite agreement on behalf of Syria to sign an international law convention that required a promise to destroy its chemical weapons stockpiles, Assad launched another attack. In 2017 at least 92 people were killed, including 30 children. Today, the town of Khan Sheikhoun is now the victim of two chemical weapons attacks within two years. Russia has blamed the airstrike on a rebel-held storage housing, but the opposition groups maintained that they lacked the capacity and ability to produce chemical weapons. Russia is a key player in the Syrian civil war because of their role in propping up Bashar al-Assad after the violent crackdown of civilian protests during 2011. Through their partnership with Assad, they have been strengthening their power base in the Middle East. As a bordering nation, Turkey was at first reluctant to support the Assad regime but has since supported Russia in their efforts to fight the Kurdish forces. While Iranian reasons are more sectarian in nature than the other two foreign powers. The Iranian government wants to maintain the status quo of a Shia government in Syria. Iran has been protecting Assad by providing both military and financial support. Iran has been investing heavily in the regime. Hezbollah is also a largely Shia Islamist militant group based in Lebanon. Fateh al-Sham according to Khan University, is more dangerous than ISIS although they are allied with the rebels in the fight against the regime. They are secretly funded by Qatar and are the major guerilla army in Syria. Their goals are to overthrow the regime and establish an Islamic emirate in Syria. Although like the Islamic state in that they fight against Assad, their goals are separate from each other. According to BBC, Fateh al-Sham instead preferred to continue to affiliate itself with al-Qaeda. However, their name change from al-Nursa Front symbolizes their cutting of ties from that specific jihadist group. There are many different groups and different causes tearing Syria in every direction. According to Khan University and as of 2017, the Regime has control of 35 percent of the country including strategically placed cities, such as the capital, and the coast which includes most of the population. The Islamic State also holds the same percentage of land however most of their land is uninhabited. The YPG along with the Syrian Democratic Front controls around 18 percent of territory. Lastly, other Rebels including Fateh al-Sham control around 12% of the country. China and Russia have vetoed and blocked every resolution to take action. While this limited strike satisfies our need to “do something”, the long-term goals of the strike are unclear. According to the New York Times, these allied airstrikes will set back the production of sarin gas but will not stop Assad from further research and development of chemical weapons. According to General Mckenzie, “They still have ability to conduct attacks; I would not rule that out,” Debates surrounding the Mddle East, according to the Center for Strategic and International Studies’ Anthony H. Cordesman, have surrounded not what the path forward is to end the war, it is when we can exit. Due to the ever-present threat of extremism and terrorism, it is easy to respond disproportionately to the events at hand, since the strategies of a terrorist is to goad, terrorize, and destroy. When one terror group is eliminated by force, another pops up in its place. Due to this strategy I believe the best counter that the US should continue to build community resilience by staying in the region and do what we can deliver immediate humanitarian assistance. The Kurds have proven to assets in our fight against the Islamic State and may be at risk if we were to abandon the region after investing our “blood and gold.” While we have been hesitant to intervene, there is a larger range of options. The United States should accept more refugees, on the condition that they go through security and background checks that would certify that they are not malicious actors. The US should attempt to prevent direct military confrontation with Russia, while undermining their influence in Syria through directly addressing the underlying causes of the fighting. Only the right combination or pressure and persuasion with the sole end goal being a ceasefire and resumption of political negotiations. Khan, Hafeez Ullah, and Waseem Khan. “Syria: History, The Civil War and Peace Prospects.” Journal of Political Studies, vol. 24, no. 2, 2017, pp. 557–573. Abratt, Daniela. “U.S. 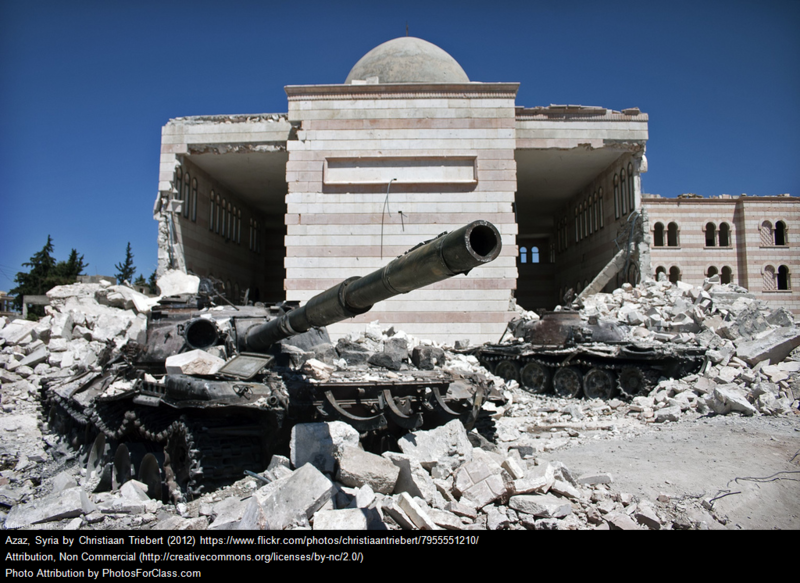 Intervention in Syria: A Legal Responsibility to Protect?” Denver Law Review, vol. 95, 2017, pp. 21–71. 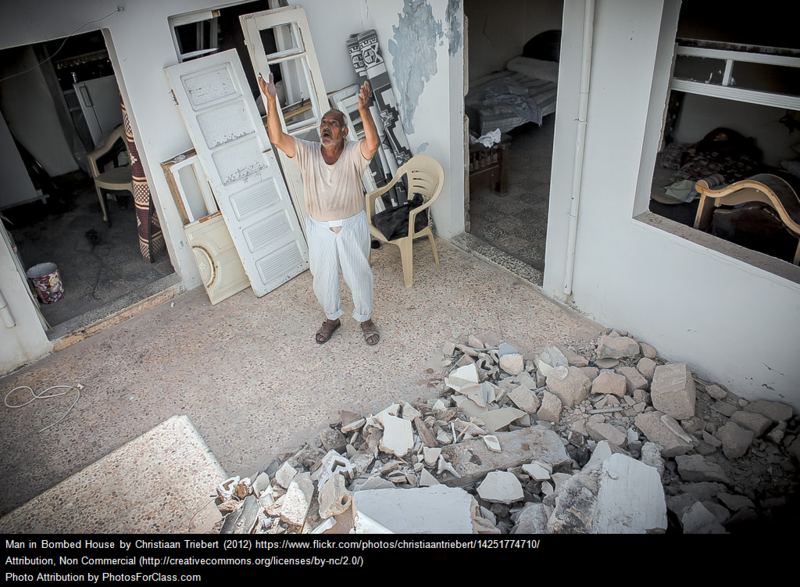 Cordesman, Anthony H. “Syria: When and How Does This War End?” Syria: When and How Does This War End?, Center for Strategic and International Studies, 10 Apr. 2018, www.csis.org/analysis/syria-when-and-how-does-war-end. Dalton, Melissa G. “Trump’s Missile Strikes Show He Needs a Broader Strategy in Syria.” Fortune, 7 Apr. 2017, fortune.com/2017/04/07/trump-syria-airstrikes-strategy-missile-strikes-us-attack/. Gibbons-Neff, Thomas. “Missile Strikes Are Unlikely to Stop Syria’s Chemical Attacks, Pentagon Says.” The New York Times, The New York Times, 19 Apr. 2018, www.nytimes.com/2018/04/19/world/middleeast/syria-strikes.html. Aliprandini, Michael. “Syria.” Our World, 2013. EBSCOhost, 0-search.ebscohost.com.libus.csd.mu.edu/login.aspx?direct=true&db=ers&AN=88391195&site=eds-live. “Syria War: Who Are Jabhat Fateh Al-Sham?” BBC News, BBC, 1 Aug. 2016, www.bbc.com/news/world-middle-east-36924000.